DIE Lunæ, 1 die Octobris. Ds. Delamer. Being not well, was excused. Ds. Leigh. Being sick, was excused. Ds. Herbert de Cherbury. Coming up. Excused. Ds. Gerard de Bromley. Not Well. Excused. Ds. Willoughby de Parham. Extra Regnum. Excused. Epus. Carlile. Is coming up. Excused. Epus. Cov. et Litchfeild. Excused. Epus. St. Asaph. Excused. Proxy. Viscount de de Stafford. Excused. Comes Sandwich. Extra Regnum. Excused. Comes Winchilsey. Extra Regnum. Excused. Comes Warwick. Not Well. Excused. Comes Exon. Not Well. Excused. Comes Bedford. Not Well. Excused. Comes Rutland. Not Well. Excused. Comes Shrewsbury. Not Well. Excused. L. Steward of His Majesty's Household. Excused. 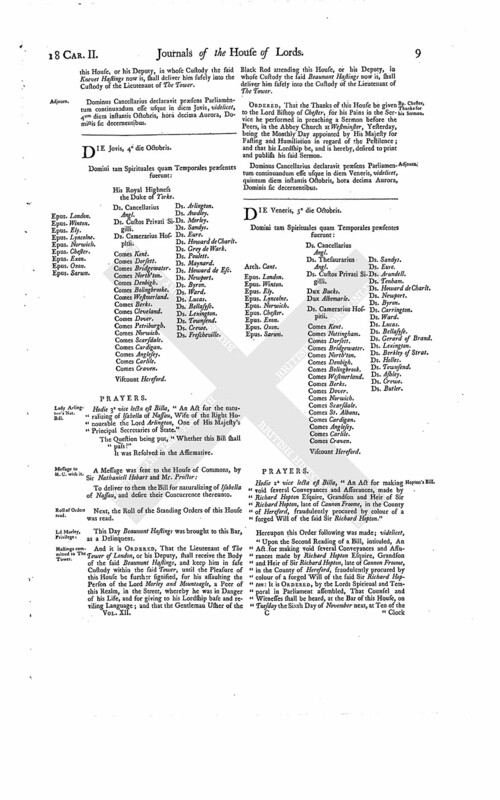 The Earl of Dorsett reported, "That the Committee have considered the Bill for naturalizing the Lady Arlington, and thinks it fit to pass, with a few Alterations." Which, being read Twice, were Agreed to; and the Bill is ordered to be engrossed with the said Alterations. ORDERED, That the Roll of Orders be read on Thursday Morning next. 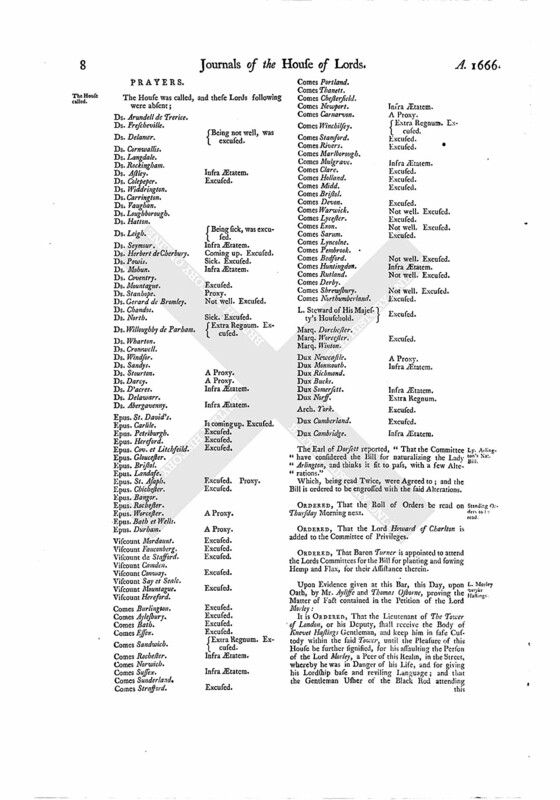 ORDERED, That the Lord Howard of Charlton is added to the Committee of Privileges. ORDERED, That Baron Turner is appointed to attend the Lords Committees for the Bill for planting and sowing Hemp and Flax, for their Assistance therein. 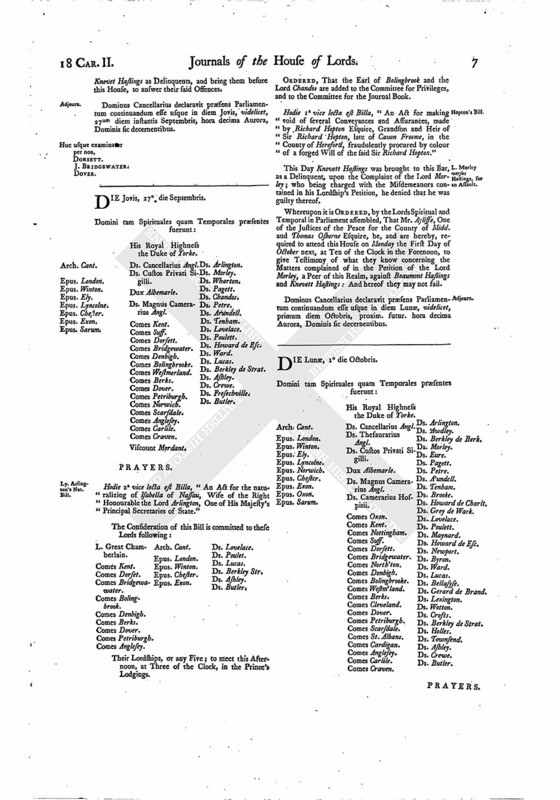 It is ORDERED, That the Lieutenant of The Tower of London, or his Deputy, shall receive the Body of Knevet Hastings Gentleman, and keep him in safe Custody within the said Tower, until the Pleasure of this House be further signified, for his assaulting the Person of the Lord Morley, a Peer of this Realm, in the Street, whereby he was in Danger of his Life, and for giving his Lordship base and reviling Language; and that the Gentleman Usher of the Black Rod attending this House, or his Deputy, in whose Custody the said Knevet Hastings now is, shall deliver him safely into the Custody of the Lieutenant of The Tower. Dominus Cancellarius declaravit præsens Parliamentum continuandum esse usque in diem Jovis, videlicet, 4um diem instantis Octobris, hora decima Aurora, Dominis sic decernentibus.